News-SkinCure stands at the center of the Hallyu, the Korean wave. SkinCure stands at the center of the Hallyu, the Korean wave. SkinCure, Inc., well-known as skin care products made of camellia flowers from Jeju (CEO Myeong-Ok Kim), attended China Beauty Expo2014 which ran from 7th to 9th May, 2014 at Shanghai New International Expo Center. As the largest cosmetic exhibition in Asia, China Beauty Expo hosted its 19th edition, and all areas of cosmetic companies related to the beauty industry such as Packaging, Nail, Hair, and Spa, participated. Every year, companies in cosmetics and beauty industry throughout the world are paying attention to China Beauty Expo. 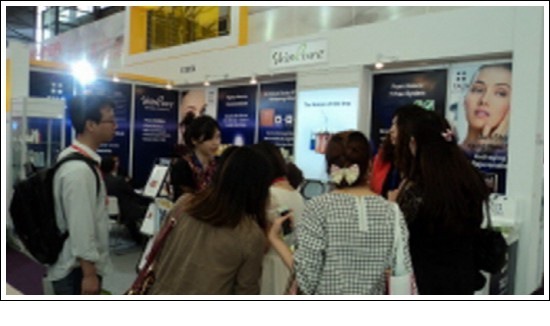 In response to the needs of various customers, SkinCure exhibited their products for China market research. Not only manufacturers that wish ODM and OEM, distributors, dermatologists, and beauticians showed a lot of interest in SkinCure products such as Stemcello, the advanced stem cell cosmetics, and TALS, a cosmeceutical brand for aesthetics and clinics. TALS pursues functional skincare products that have a multi-layered capsule structure to enhance skin penetration and absorption of useful substances. The main products of TALS are premium ampoules for professional use (PropaWhite Magic Ampoules, ActiStem Gold Nest Revitalizing Ampoules), spot treatment for skin troubles, and firming creams for wrinkle care, which are all certified by KFDA, Korean Food & Drug Administration, as whitening and anti-aging products. Myeong-Ok Kim, the CEO of SkinCure, said “TALS premium ampoules for professional use aroused a huge and enthusiastic response from the public. Some buyers wanted mass purchase on-site, but were disappointed because we only brought samples for the exhibition.” After trying out some products of SkinCure, local buyers showed a lot of interests in TALS products for home care and professional use. China Beauty Expo2014 has become the most influential beauty exhibition for international cosmetic companies in the world. The China Beauty Expo 2014 placed SkinCure to the center of the Korean Wave, called Hallyu. Capitalizing on this event, SkinCure is planning to promote their cutting-edge cosmeceutical technologies via upcoming beauty exhibitions in China, Turkey, Thailand, Malaysia, and Hong Kong.